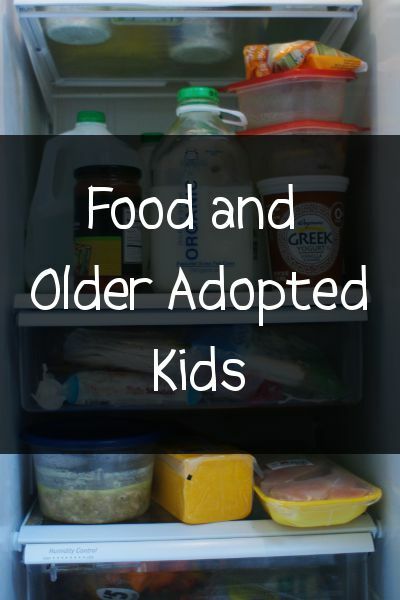 Food is one of the hot topics that comes up often on adoption forums and in support groups. Because kids from hard places often need control to feel safe (remember that ‘feel’ is different than ‘be’), it’s important to pick and choose your battles. If a family does not choose to let their child(ren) feel felt control in some areas, they will find themselves fighting many more battles (and maybe some that are a lot less pleasant like toileting). Who and What: Each child needs to eat what resembles about 3 meals a day and a snack or two. Each meal has to have a protein and 2 meals have to have a full serving of a vegetable (with one being a green one). Everyone (except my dairy free little guy) has to have a glass of milk a day, too. When: There are general meal times but I’m pretty flexible on this. Sometimes a rolling meal time is easier since there are so many of us and our kitchen is small. We do sit down for family dinners as often as our schedule allows. Where: We have a couple designated eating areas–kitchen island, dining room table, living room coffee table. How: Everyone except our youngest is capable of fixing what they want to eat. Our oldest independent food-fixer started at a mature 8-years-old. The other kids or I still serve our not-so-mature 7-year-old. I cook meat in large quantities and keep the fridge and pantry stocked with lots of staples. The kids are allowed to use the stove, toaster oven, and microwave as long as there is an adult home. Occasionally, I make smoothies, omelets or potstickers by request. Why: When our big kids came home, I tried to control what everyone was eating and make everyone conform to what I was cooking. I was constantly annoyed at the complaining and who wasn’t eating my cooking. Additionally, as our honeymoon ended and we spent more and more days in crisis, I couldn’t keep up with cooking and relied on the kids more and more to fend for themselves. How we operate now is so much less stressful for everyone and allows those that need a modified diet to have one without making me crazy. What if my kid has <<insert food>> at every lunch and dinner? As long as there is a protein and veggie involved, they’ll be fine. I have a kid who eats pasta and a half a cucumber at the majority of his meals. Do I wish he would branch out? Yes. Is it the end of the world? No. We eat out at ethnic restaurants periodically and he does a good job of trying new foods in those situations. By the time he’s an adult, he’ll probably be better exposed that most of his peers. I just remind myself of that every time I’m tempted to ream him out for going through another box of spaghetti single-handedly. Do your kids take supplements? Most of them take them regularly. We’re using mostly supplements from a wellness company* because they are sources from whole foods. Two of our most challenging kids take high doses of high quality liquid fish oil from Vitacost. Besides a general multi, we also try to be regular about using a probiotic. *If you’d like a sample of the supplements or want to know which ones we use, send me a message. What kinds of things do your kids make? Creations with meat, tortillas, bread, pasta, cheese, sauce, sour cream and cream cheese. Most of the kids will eat steamed edamame and roasted seaweed. We also stock frozen peas, cucumbers, carrots, and cole slaw mix (which we use like salad because it keeps longer). Meat, nuts, dairy, and edamame. What special diets do you guys have going on? Ty (our 7 year old) and I are mostly grain and dairy free. Our 13-year-old is completely grain free. Both of those guys eat completely clean (no artificial preservatives, colors, or flavors), and I’m trying to move our entire family closer to that as well. Why not just require them to eat what you make or go hungry? For kids with a history of hunger or trauma, ultimatums result in ugly control battles. Ours would seriously go hungry or start sneaking and stealing food they did want. They would also not see us as people who could be trusted to feed them which would distrust all the way down the line. If you’re in a similar boat to us, I’d love to know what’s worked for you or to answer any additional questions for how this idea can work for your family. Posted in Adoption and Orphan Care, Slider, Uncategorized and tagged Adoption and Orphan Care, food. Hi Melissa: I have two adopted sons. My first son was adopted at birth. He has always been a good eater-not to picky. My second son was adopted at 4 years old. He experienced lots of abuse, trauma, and neglect. He sneaks food and has become overweight-actually obese. The pediatrician is on me all the time about his weight. It has become a power issue. How do I stop the struggle. We tried several things that have not worked very well. We let him know when all meals and snacks will be served, We ask him to only eat at meal times. He is 13 and self concious about his weight. He will steal food from the cupboard. I bought a lot of beef jerky on sale and he $250 worth in about a week. The eating has gotten worse since his bio mom died a year ago. We have done outpatient counseling ect…… My thought is let it go. He can eat at predetermined times and if he sneaks food there is a consequence-he has to do chores to pay for the food he ate. He went to a wilderness camp last year, I was amazed-they had no snacks and he did not complain. He LOVED it. I am missing something here. Any suggestions? Food issues can be VERY tricky and they tend to run VERY deep. If I were you, I would address the trauma issues (rather than the food issues). Usually when the trauma is processed, the other behaviors resolve on their own. Have you ever tried any bodywork for releasing or processing trauma like EMDR or TRE? I let my son go in the refrigerator and/or cupboards and eat what he wants. He is 17. He gives him a sense of I am really home. We’ve found this is great as long as I don’t have anything in the house I really don’t want them eating. Otherwise, they would just help themselves to junk all day long  Labelling food with limits like, “1 per day,” helps too.